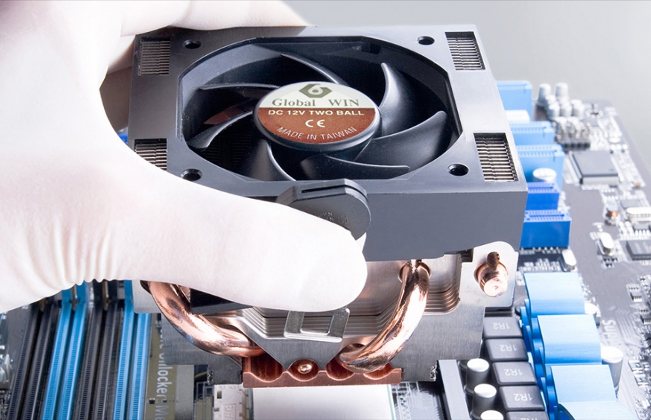 A CPU cooler is the key device to effectively dissipate the heat generated by the CPU and brings down the operation temperature accordingly. The main design theory is to utilize heatsinks to conduct the heat, and then have the fans blow it away to complete the dissipation process. In the 286/386 CPU era, the number of transistors inside the CPU was not big due to the limited number of bytes and low frequency (~6mhz to 12Mhz only). Therefore, the power consumption can be controlled under 3~4 Watts. By means of the free convection between CPU itself and air, the operating temperature could be successfully lowered. In those days, increasing the dissipation area by applying heatsinks to enhance the free convection would be good enough to solve the thermal problem. However, after the launch of 486 (50Mhz) CPU, the power consumption had climbed up to 8 Watts. The thermal problem then could not be effectively solved without forced convection which is created by CPU cooler. Notable examples include Pentium 233 MHz (power consumption: 18Mhz) and AMD K6 233MHz (28.3 Watts). Great heat dissipation function to lower the CPU temperature as much as possible. Long life-cycled fans with low noise. Well-designed clips to ease up the installment process. While evaluating the effect of heat dissipation, people should not only consider not letting the CPU overheat, but also prolonging the CPU life as much as possible. In scientific terms, CPU life and temperature is an inverse ratio. In other words, they follow the inverse power law model. If a CPU continues under a high temperature condition for a long time, that will shorten its life. For example, if m=10, at 25oC degree of normal temperature, the CPU life is around 30,000 hours. But when the temperature has reached 70oC degree, the life will shorten to 7353 hours. The general principle to maximize the effect of heat dissipation is to make larger heatsinks with high C.F.M. Good motor design: It can be tested by pointing the running fan to make it stop and then rotate the fan toward the same direction again with a low speed. With a poor fan design, the fan will stop running again when meets the "dead point". The noise problem can be solved by choosing medium-speeded fan instead of high speeded one. However, at the same time, the effect of medium-speeded fans not as powerful as the high-speeded one. The good news is that it can be compensated by creating the ventilation holes on the bottom of heatsink. This design is specially made by Global WIN Technology R&D team and has been approved by the Taiwan Central Standard Organization and granted a patent (Patent number 115376). Then ventilation holes will not only enlarge the heat dissipation area, lessen the weight of heatsink, lessen the air pressure but also increase the air flow. All these will further straighten the effect of heat dissipation.